The Pennsylvania Fish and Boat Commission (PFBC) evaluated the tiger muskellunge and Muskellunge populations in Nockamixon Lake between April 16 and 23, 2015. The PFBC manages tiger muskellunge and Muskellunge populations in many lakes and rivers across the Commonwealth. In southeastern Pennsylvania lakes, these populations are dependent upon hatchery stocking of fingerling to provide desirable recreational fisheries, as no lake reproduction of Muskellunge occurs in the southeastern portion of the state. The 2015 trap net survey was a continuation of a multi-year study that began on the lake in 2012 as part of a larger program designed to evaluate the effectiveness of enhanced stocking rates and regulation changes (no closed season, 1 fish/day, 40 inch minimum size) on musky populations statewide. Please see the PFBC’s Musky Fisheries Management Plan for more details. The park is managed by the Pennsylvania Department of Conservation and Natural Resources (DCNR) and is located approximately 5 miles east of Quakertown and 10 miles north of Doylestown. The PFBC has stocked Nockamixon Lake with tiger muskellunge and/or Muskellunge since the fish community was originally established in 1974. Fry were only stocked once during the history of the lake and included the stocking of 150,000 tiger muskellunge fry in 1974. Pure Muskellunge fingerlings were stocked in 1992 to 1994, 1996, and 1999 with no success; therefore, their stocking was discontinued by the PFBC. Tiger muskellunge yearlings were stocked in 2007 and 2010, and fingerlings have been stocked in 31 of the last 41 years since 1974. Although the frequency and rate of tiger muskellunge fingerling stockings varied somewhat over the years due to the stocking of unallocated or “extra” fish from the PFBC’s hatchery system, stockings typically occurred every other year at a rate of 5 fish/acre or 7,250 fingerlings. In 2007, the frequency of tiger muskellunge fingerling stockings was increased from 5 fish/acre every other year to 5 fish/acre every year as part of the management change to enhance selected musky waters statewide. Other southeastern Pennsylvania lakes with increased Muskellunge and/or tiger muskellunge stockings include Marsh Creek Lake, Chester County, Blue Marsh Lake, Berks County, and more recently, Lake Marburg, York County. Additionally, the Susquehanna River Section 5, York Haven Dam downstream to Route 462 at Columbia/Wrightsville, Lancaster and York counties, has also received increased stockings. were collaboratively determined and coordinated with Fisheries Area personnel in conjunction with modified agency stocking programs. Twenty Pennsylvania style trap nets were set in Nockamixon Lake between April 16 and 23, 2015. Four trap nets were set daily in water depths ranging from 4 to 12 feet and allowed to fish overnight for approximately 22 hours before being tended the following day. In general, captured fish were counted, measured, and released, and each net was then re-located to another sampling location to ensure that a random sample of suitable habitats were evaluated, including areas in the main lake, Threemile Run Cove, Tohickon Creek Cove, and Haycock Creek Cove. Captured tiger muskellunge and Muskellunge, were examined for fin clips, scanned for Passive Integrated Transponder (PIT) tags, measured for total length, and weighed. PIT tags are microchips about the size of a grain of rice implanted beneath the skin that provide each fish with a unique numerical code for future identification. A fin clip and PIT tag were applied to all untagged fish. Scales were also collected and will be used in combination with sectioned fin rays for age and growth analysis. Nockamixon Lake supports a very good tiger muskellunge population. A total of 25 tiger muskellunge, ranging from 31 to 41 inches long and 7 to 16 pounds, were captured during the 2015 trap net survey. Most fish were between 34 and 38 inches in length (see Figure 1). The tiger muskellunge catch rate was 0.05 fish/hr or five fish for every four trap nets set. This catch rate was comparable to the 2013 and 2014 catch rates of 0.06 and 0.05 fish/hr, respectively, and exceeded the statewide catch rate objective of 0.01 fish/hr established for Pennsylvania’s reservoirs (see Figure 2). Figure 1. Length frequency distribution of tiger muskellunge and Muskellunge trap netted in Nockamixon Lake in April, 2015. The abundance of pure Muskellunge in Nockamixon Lake was remarkably high in 2015 due to exceptional survival of the advanced fingerlings stocked by MI50 in 2012. A total of 84 pure Muskellunge, ranging from 25 to 35 inches long and 4 to 12 pounds, were captured during the 2015 trap net survey. The majority of fish were between 30 and 33 inches in length (see Figure 1). None of the pure Muskellunge captured were of legal size (40 inches). Several of the smaller Muskellunge (25 to 27 inches) captured were likely from the 2013 MI50 stocking. Many of the Muskellunge captured were sexually mature males and females in spawning condition. Although some spawning may occur, it is highly unlikely that it would be successful or that natural reproduction could sustain the fishery in Nockamixon Lake. The pure Muskellunge catch rate was 0.18 fish/hr or nearly 17 fish for every four trap nets set. This catch rate was much higher than the 2014 pure Muskellunge catch rate of 0.05 fish/hr and statewide catch rate objective of 0.01 fish/hr established for Pennsylvania’s reservoirs. fingerlings were not stocked by the MI50 club until October, 2012 and did not begin recruiting to the trap net gear until 2014.
with clipped fins were recaptured in 2015, but no PIT tags were found. The clipped left pelvic fins signified that the untagged fish were originally captured by trap nets in 2012 or 2014. The absence of PIT tags generally indicated that the fish were first captured in 2012, which was prior to the PIT tagging component of the study; however, it is possible that the fish were first captured in 2014 and had shed their PIT tags. Four of the 22 pure Muskellunge that were PIT tagged in 2014 were recaptured in 2015, yielding a recapture rate of 18%. The sizes of the recaptured Muskellunge increased an average of 5.9 inches and 3.6 pounds from 2014 to 2015, meaning that they increased in size from an average of 25.3 inches and 4.7 pounds at age-2 to an average of 31.2 inches and 8.3 pounds at age-3. 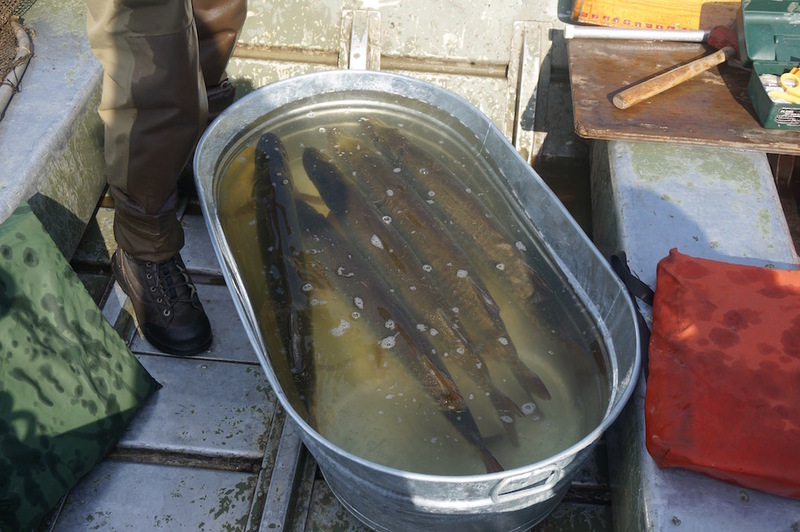 A few tiger muskellunge and pure Muskellunge were captured twice during the 2015 trap net survey and moved considerable distances between capture events. One tiger muskellunge, No. 982000359669546, was captured in a mid-lake cove near the fishing pier on April 22 and was recaptured nearly two miles away across from the Tohickon Boat Ramp the next day. This fish also had an existing left pelvic fin clip when captured on April 22, indicating that it had previously been captured in 2012 or 2014. Another Muskellunge, No. 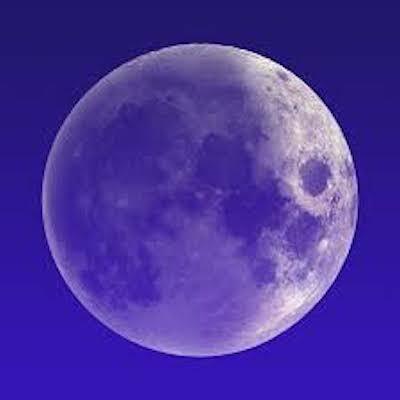 982000359669751, was captured across from the Three Mile Run Boat Ramp on April 17 and was recaptured nearly five miles away across from the Tohickon Boat Ramp seven days later. Nockamixon Lake is managed as a multiple use fishery offering a variety of species for anglers to target. Many other fish species were captured during the 2015 trap net survey, such as Black Crappie, White Crappie, Bluegill, Brown Bullhead, Yellow Bullhead, Chain Pickerel, Channel Catfish, Common Carp, Largemouth Bass, Striped Bass hybrids, Walleye, White Catfish, White Perch and Yellow Perch (see Table 1). Nockamixon Lake supports quality catfish populations. A total of 85 Channel Catfish, 114 White Catfish, and 112 bullheads were captured during the survey. The total catch for Channel Catfish was below average for southeastern Pennsylvania, likely due to the early timing of the survey. Channel Catfish reached 28 inches in length and fish over 20 inches in length comprised 42% of the trap net catch. White Catfish ranged up to 21 inches in length. A 30 inch Flathead Catfish was also captured during the survey, which was the first documented occurrence of this species in the lake. Flathead Catfish are native to western Pennsylvania but are considered invasive in other regions of Pennsylvania, such as the Delaware River basin where they have established themselves at least as far upriver as Easton. In addition to musky and catfish, Nockamixon Lake supports good populations of other large sportfish as well, such as Striped Bass and their hybrids, Walleye, and Chain Pickerel. Several Striped Bass hybrids, ranging from 23 to 27 inches in length, were captured during the survey. Although some Striped Bass hybrids will remain in the lake for a few years, the PFBC cancelled their stocking in the lake after 2009 in favor of pure Striped Bass fingerlings, which continue to be stocked annually when available. A total of 32 Walleyes, ranging from 19 to 30 inches in length, and 9 Chain Pickerel, ranging from 17 to 28 inches in length, were also captured during the survey. Bluegill were the most abundant panfish species captured, but few fish exceeded six inches in length. The total catch rate of crappie and catch rate of crappie over nine inches were below average for southeastern Pennsylvania lakes. The largest crappie captured was 14 inches in length. White Perch up to 14 inches were also captured. Few Largemouth Bass were captured, which was expected since it is well established that trap nets are not an effective gear type for capturing or monitoring bass populations. Table 1. Summary of fish species trap netted in Nockamixon Lake between April 16 and 23, 2015. Note: Trap nets are not an effective gear type for capturing Largemouth Bass. If you plan on fishing Nockamixon Lake, be advised that the lake has a 20 horsepower outboard motor restriction and is managed under the Big Bass Program Special Regulations. Nockamixon Lake has four boat launch areas and a public fishing pier.